You know, most of the time when people ask me what my favorite musical from the Golden Age of Hollywood is, I say Singin’ in the Rain (you can see my thoughts on this immortal classic here: http://annacampbell.com/my-favorite-things/2018-2/september-2018/). It’s so funny and clever and charming. 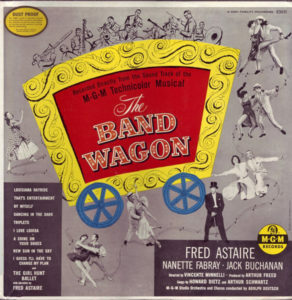 But there are days when my answer would actually be different, and instead, I’d say that my favorite musical is The Band Wagon, which isn’t nearly as well known as SITR. 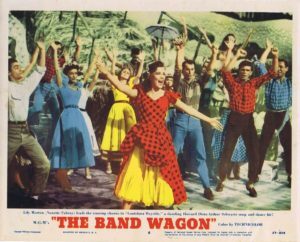 The Band Wagon (1953) always seems much more grown up than SITR (or any of the other films I’m going to feature on this mini series about favorite movie musicals). It’s got a lot of joie de vivre, but it’s joie de vivre achieved amidst the possibility of failure and loss and missing out on love and life. 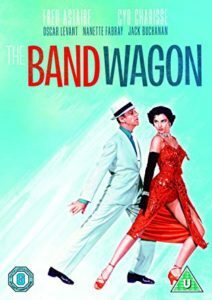 Perhaps some of this wistful, bittersweet quality that marks this film comes from the fact that Fred Astaire, the star, was 54 when he made this, whereas Gene Kelly in the earlier film was only 40. While Fred still dances up a storm, especially in the fabulous number Shine on Your Shoes just after the opening, there’s definitely a feeling that his character Tony Hunter is about to meet his last chance for love and success. 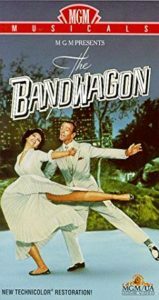 As far as the production goes, The Band Wagon has quite a bit in common with Singin’ in the Rain. The same producers, Arthur Freed and Roger Edens. A score cobbled together from the great American songbook, in this case the songs of Arthur Schwartz and Howard Dietz. 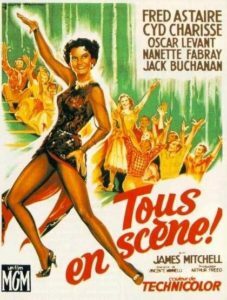 Cyd Charisse in a major role, although in this film she’s the leading lady, not just featured in the ballet. A witty script by Adolph Green and Betty Comden. The fabulous production values of MGM at its best. But as you’re probably gathering, the feel of the film is completely different. 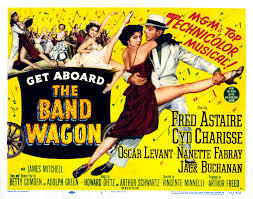 The Band Wagon‘s plot is based on that staple of the Hollywood musical – “Hey, guys, let’s put on a show!” Tony Hunter is a former big dance star in the movies (there’s some sly and amusing references to Fred’s films with Ginger Rogers) who is facing declining popularity, to the point where the film opens with the sale of his personal effects at an auction. In an attempt to revitalize his fading popularity, he’s agreed to star in a Broadway show written by his friends Lester and Lily Marton (Oscar Levant and Nanette Fabray). They’re overjoyed that they’ve managed to lure the current darling of the serious theater, Jeffrey Cordova. to direct. British musical star Jack Buchanan plays the pompous but essentially good-hearted Cordova for all he’s worth – his performance is one of the joys of the film. One of the loveliest musical numbers is a top hat and tails duet he does with Fred Astaire, I Guess I’ll Have to Change My Plan. Instead of the light and charming musical comedy the Martons and Tony envisage, Cordova decides to do a modern take on Faust, starring Tony and beautiful ballerina Gaby Girard (Cyd). Tony and Gaby are both suffering from insecurity about fitting in with the other’s dancing style and individual realm of expertise, so it’s hatred at first sight (you know where this is going, don’t you?). My favorite scene in the film is the subtle and romantic number Dancing in the Dark. Tony and Gaby take a stroll through Central Park in an attempt to find some common ground, and gradually start to dance. Hesitancy turns into exquisite harmony. By this stage, Tony has fallen hard for Gaby, but she’s in a long-term relationship with the volatile and arrogant choreographer of the show, Paul Byrd (James Mitchell). Most of the film charts the development of the production up to the disastrous try-out of the Faust version in New Haven, the complete revamping of the show to something closer to the Martons’ original intentions, and finally a triumphant debut on Broadway. On the way, we get to see a string of brilliantly staged musical numbers – director Vincente Minelli was a master at this genre and you can admire his style in every frame of this film. At the end, Tony gets a new career and the girl. Big happy sighs from me. A couple of highlights. The famous That’s Entertainment number, which has some of the wittiest lyrics I know of in a Broadway show. Love the take on Hamlet – “When a ghost and a prince meet, and everyone ends up mincemeat!” A very funny and disastrous version of You and the Night and the Music with Cordova as the Devil throwing fireworks around the stage and sending poor Gaby and Tony mad. And the Girl Hunt ballet which I actually like better than the final ballet in Singin’ in the Rain. So shoot me. Speaking of shooting, Cyd Charisse really comes into her own here as a sultry nightclub brunette and a seemingly innocent blonde, both of whom have Fred’s detective character in a spin (literally). If you haven’t seen this masterpiece from old Hollywood, please grab yourself a couple of hours and settle in for some total pleasure. The Band Wagon is a real corker!